The functional and evolutionary implications of primitive retentions in early hominin feet have been under debate since the discovery of Australopithecus afarensis. 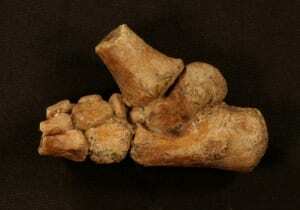 Ontogeny can provide insight into adult phenotypes, but juvenile early hominin foot fossils are exceptionally rare. The focus of this paper is a thorough analysis of a nearly complete, 3.32-million-year-old juvenile foot of A. afarensis (DIK-1-1f). The results show that juvenile A. afarensis individuals already had many of the bipedal features found in adult specimens. However, they also had medial cuneiform traits associated with increased hallucal mobility and a more gracile calcaneal tuber, which is unexpected on the basis of known adult morphologies. Selection for traits functionally associated with juvenile pedal grasping may provide a new perspective on their retention in the more terrestrial adult A. afarensis. DeSilva, J.M., Gill, C.M., Prang, T.C., Bredella, M.A., Alemseged, Z. 2018. A nearly complete foot from Dikika, Ethiopia and its implications for the ontogeny and function of Australopithecus afarensis. Sci Adv. 4(7), eaar7723.